On Sunday, April 29th, PRSSA participated in our first Community on the Quad event. This event is held yearly in the spring and is an opportunity for student organizations to promote themselves as well as have a nice day outside. This year’s theme was “What Happens on the Quad, Stays on the Quad,” a Las Vegas theme. It was held on the Linden Quad. Each student organization was able to theme their table based off of a casino such as the ones in Las Vegas. 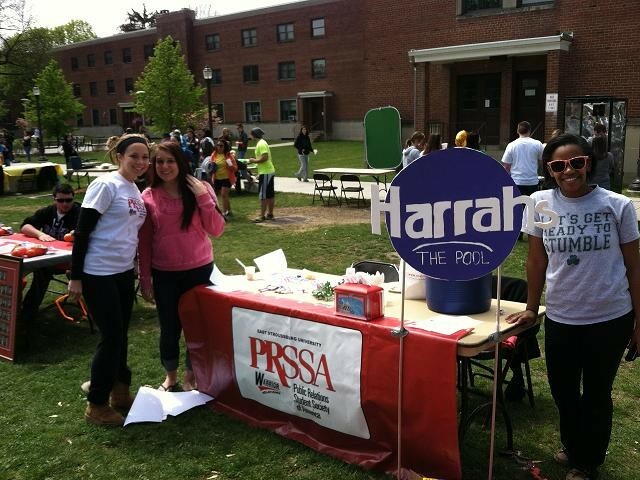 PRSSA chose to represent Harrah’s and more specifically it’s pool. This event is not limited to the campus community, all people are welcome as well as all ages. Each table is encouraged to provide an activity for visitors to participate in. After receiving some donated Rita’s italian ice, PRSSA came up with a game involving picking up ducks out of their blow-up pool to determine prizes. A blue dot represented another try at the game, an orange dot granted the player with a PRSSA pen, and a red dot was a winning cup of free Rita’s Italian ice. This nice Sunday afternoon included free cook-out style lunch, a bounce house, a live band, and more to accompany the student organization tables. All members participated in this fun day wearing their PRSSA “Reputation is Everything” tee-shirts. It was a great first year and hopefully will become an annual event for our chapter.